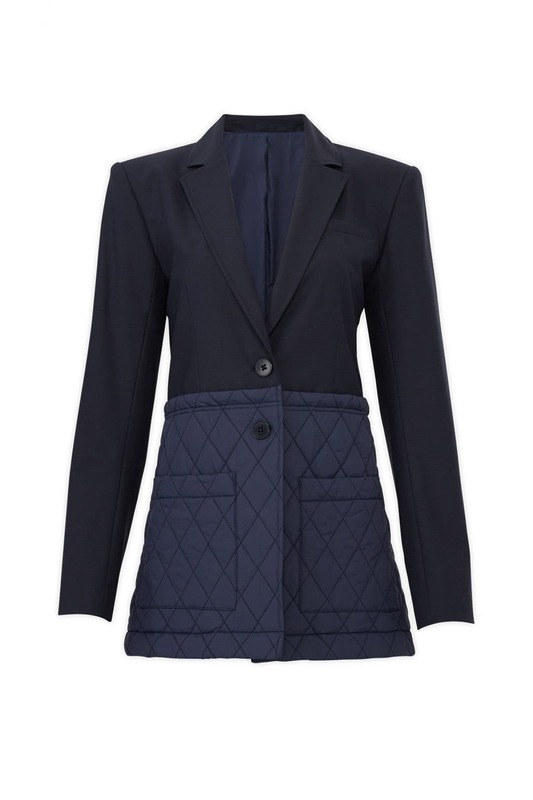 Diamond-quilted construction brings a modern sensibility to this smart Tibi blazer we love in any season. Navy wool (53% Polyester, 43% Virgin Wool, 4% Lyocell). Blazer. Long sleeves. Front button closures. Fully lined. Front pockets. Back button detail. 30.5" from shoulder to hemline. Imported. I rented size 12 and it was HUGE. The legnth of arms was very long on me and whole jacket in general.was very oversized. Not a tailored fit. Didn't actually get to wear, it was too big going to order smaller size because I loved it so much. Beautiful, well-tailored blazer. Ordered one size down based on an earlier review, and the 6 fit perfectly. I'm 5'11'' with long, monkey arms and the sleeves were the perfect length. Well constructed chic update to the blue blazer. Lovely style but a 2 is more like a 6. Honestly was more blazer then coat. Felt like I looked like I could be in a horse show competition. Nice fit. Looks better in person. I absolutely loved this blazer and was happy with it even though it was a little big. Excellent quality and nice for dressing up jeans and boots. Great for a fall look. Tried this on and it was HUGE at a size 6, should have sized down at least two sizes. Disappointed. Runs a bit big in the shoulders and sleeves. It was a well made and designed jacket. I liked the colors and lack of detailing. This blazer is amazing! It's a real conversation piece. It's supposed to be oversized but it was huge. So ... shoulder pads just did not cut it for me. Too, too broad. Loved the fabric and design when not on me! Quilt accent is a winner! This jacket was a cute option for a fall visit to Virginia. Super cute but not too heavy. Too big! Was not for my body type! 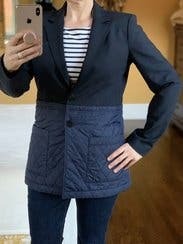 This is a great jacket over jeans, dresses, slacks,etc. Versatile for casual or office. Definitely runs big so size down! This is a great flattering jacket with some nice unusual touches. Fit true to size (with broad padded shoulders). The two colors are subtle, and the quilting (which is nylon fabric) is fun. Love it. I am tall and it was the only blazer i have ever worn that fit. Many compliments. It was long in the arms. Oversized. I loved it. It could be dressed up or down. I wore this to work in DTLA on what have might've been a day with California rain. Professional & chic, my coworkers freaked. Underwhelming blue blazer. Basic, but nothing special. Runs 1 size large. This blue blazer is fine, but nothing special. I was disappointed in how thin the fabrics were. 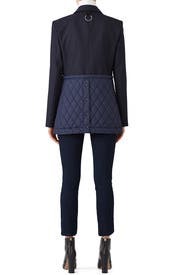 The quilted part of the jacket has barely any padding inside, which makes the quilting effect look off. I ended up not wearing this blazer. In terms of sizing, it runs 1 size large. 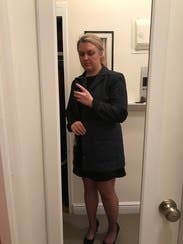 I am usually a size 10 in tops (5'8", 155 lbs, 36C) and this jacket in size 8 fit well. Be aware that the sleeves are very long (and with plenty room for larger arms). Loved this jacket. Unusual with the light quilted lower part and friends loved it. I wore it with Rag&Bone pants that are now on RTR (plaid Simone pants) and a simple black silk top) and also with black jeans. Sleeves are a bit long but can be rolled. Will definitely rent again. Really big, boxy and roomy. I am full-chested and usually wear an 8 or 10 jacket and the 8 was swimming on me. Had to roll up the sleeves because too long. Loved the color and overall style, but not the fit. Next time: trust the reviews! Like the majority of reviews, this runs large. I should have sized down to the 4. The fabric has a good structure, and the look is great with jeans and boots. Just too big. The fabric feels cheep. Is this subprime quality for rtf? The fit is true but a little broad across the shoulders. The fabric wasn't as substantial as I would of hoped but it looked great. I tried to pair it with a variety of looks but skinny jeans and boots, a la the model made the most sense. I got several compliments. Great piece and very comfortable! I liked but did not love great fit and comfortable though! Back of collar has a weird attachment that looks like a hanging hook that should be removed. Sleeves too long. Sleeves were too long and I have long arms! Looked way too big on me. I have broad shoulders and this jacket looked tailored but was comfortable. The dual fabrics made it look interesting and stylish. Would order again for any type of business event. Great fit on the shoulders and the details were amazing. 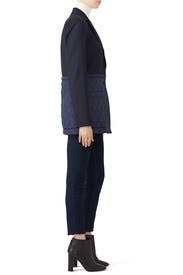 Sleeves were too long for my petite size and, because of that, the middle button wouldn't close because it was near my widest area on my pear shape. Big in shoulders and long in sleeves. Extremely boxy fit and quilted part is puffier than expected. I'm bummed - not as good a fit for me as in photo. But cute if it works for you. Note that quilted part has snaps in the back which you can't see - cool. This jacket was a show stopper. Wore this to work and got tons of compliments.